JGarden Description: Managed by City of Seattle, Dept of Parks & Recreation, Univ. of Washington, and the Arboretum Foundation. Located within the Washington Park Arboretum. A 3 1/2 acre site designed and constructed by Iida Juki in 1960. Tea ceremony (chad�) demonstrations are offered periodically in the teahouse (call 206.324.1483 for more information). 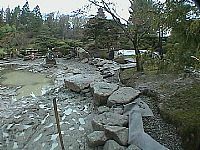 An extensive article by Koichi Kobayashi on the History of the Seattle Japanese Garden is available. Japanese Garden of Seattle Slideshow - a slideshow of high-resolution images plus koto music of the Japanese Garden of Seattle. Note this is actually a Real Networks link and will require the RealPlayer and pretty good bandwidth (DSL or Cable) to view it. Iida Jûki. "The Japanese Garden at the University of Washington." Translation of article published in Japanese in Niwa 12 (February 1974), pp 17-24. Iida, Jûki, and Associates. "Our Japanese Garden." Washington Park Arboretum Bulletin. 23:4 (Winter 1960), pp 139-140. Kobayashi, Koichi. "Legacy of the Japanese Garden of Seattle: Past, Present and Future." Unpublished. December 2003. Kruckenberg, Arthur R. "The Japanese Design Connection --Northwestern Natives in the Japanese Garden." Washington Park Arboretum Bulletin. 60:1 (Winter 1998), pp 14-18. Medbury, Scott. "The Once and Future Japanese Garden." Washington Park Arboretum. 53:2 (Summer 1990): p 2. Sorrels, Kenneth. "Jûki Iida on Building the Japanese Garden." Washington Park Arboretum Bulletin. 53:2 (Summer 1990), pp 6-10.